If you’re wondering how to approach the “Is Santa real?” question, this is for you. Some ideas on how to approach it and a quick review of the awesome book below (affiliate link). As Christmas comes this year and my daughter is going on 3, we decided to broach the subject of Santa. Culturally speaking, Santa is a major part of the Christmas tradition. Santa is on cartoons, Christmas bags, wrapping paper, and displays all around. Songs are sung about him and kids moms pay to tell him what they want for Christmas at the mall. Everyone agrees that imagination and fantasy are vitally important to children. No one wants their kids to stop pretending and playing. Does that mean it’s somehow cruel to rob our children of the Santa myth? Our home did Santa growing up and I loved it. Recently I read an article written by a mother who said that just as we can’t see Santa, we can’t see God, and she didn’t want her children to dismiss the notion of God as a fantasy as they one day would Santa. I’m not completely sure what I think about that, but I believe there is some truth there. I’m not here to debate the general pros and cons, but it gave me food for thought. We decided we would still have fun with Santa in our house, but that we would explain that he is not alive now, but was a person from the past. 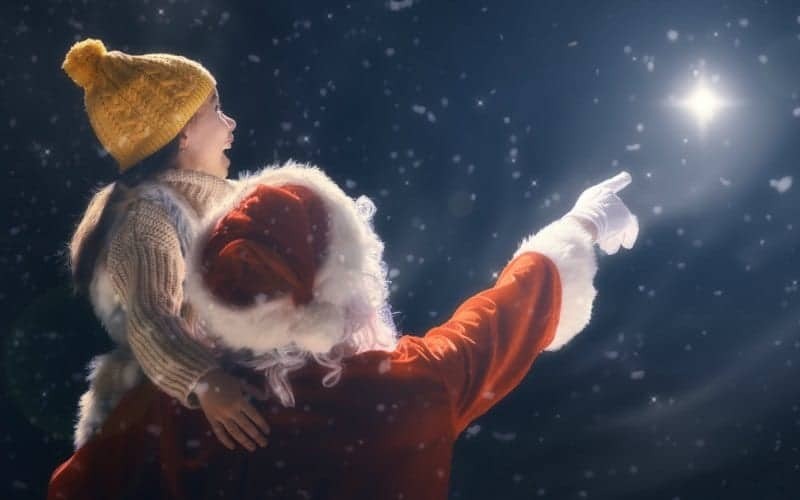 For us, telling our children that imaginary people exist who live to bring material nice things no matter if they’ve been naughty or nice (because let’s be honest, how naughty do you really have to be to get passed over?) like Santa or the Tooth Fairy may lessen their ability to believe us when we talk about God. Or think favorably about God. Because, honestly, sometimes it’s hard to be a Christian. Particularly when God isn’t showing up delivering bicycles and video games in the middle of the night. Before one spouse convinces the children is real and the other bursts their bubble the next day, it’d be a good idea to talk about what your approach will be with your spouse. My husband and I didn’t have to talk long before we reached a consensus. Also, it’s helpful to bring up the subject with your little ones before they learn about it elsewhere. We have shown Santa videos and are reading Santa books (no we don’t wait until after Thanksgiving because then it’s over too quickly) and singing Santa songs. We aren’t shying away from Santa, we just aren’t pretending he’s real when he isn’t. We bought an awesome children’s book that helps explain who St. Nick was. It’s a Christian book and I think a great way to bring up the subject with your children without stealing any of the fun. There are websites dedicated to St. Nicholas and other resources that can give a wealth of information. Personally, I find it far more impacting to learn about an actual man who gave to children anonymously, and I think it really gets to the heart of the meaning of the season. 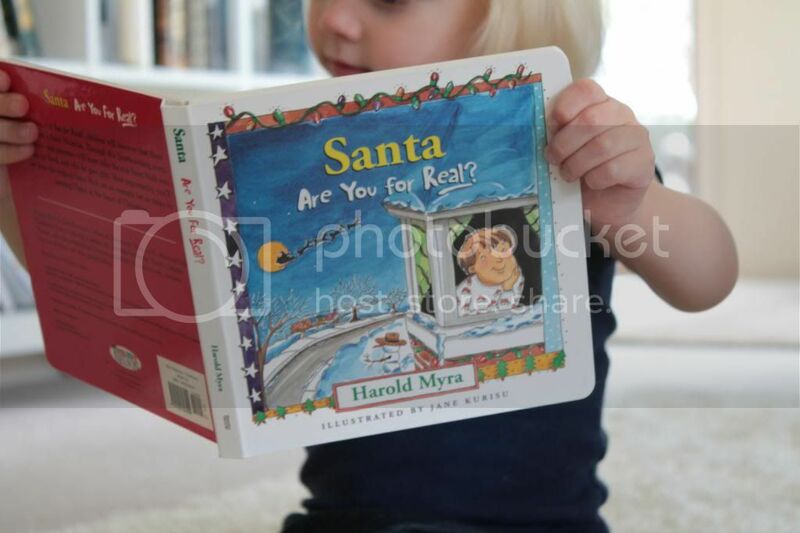 (Check out Santa, Are You For Real?, it’s a great book to teach children who St. Nick really was). Unless you want your children to tell everyone on the playground that Santa isn’t actually real, then it’s best to prepare them. Or at least ask them to keep quiet about it. Here in Australia there was a big to do a while ago when one Christian school said they would not endorse the Santa myth and that, if asked directly, they would tell the truth. This made people mad. I wouldn’t endorse this method for your children. But whatever you decide, do prepare your children to meet with others who will actively try to convince them that Santa is real. My daughter sometimes plays her fork like it’s a guitar. She knows it isn’t a guitar. She has been using it to eat so she obviously knows it’s a fork. Does that lessen the fun of her impromptu jam sessions? Not as far as I can tell. We still want to fully celebrate Christmas and have a good time and that may include playing Santa. Maybe we’ll leave cookies out for Santa or say certain presents are from Santa. It’s okay to let your children imagine. In fact, it’s good for them. I won’t rob the joy out of Christmas nor will we try to be wet blankets, and I don’t think telling the truth about Santa will do either. Whatever you decide, I think it’s important to come to a decision together as a team. If you do Elf on the Shelf, then maybe you have a similar decision. I grew up believing in Santa and have no recollection of a scarring moment when I found out he wasn’t real. I’m not even sure I think it’s “lying” per se, but this is what we’ve decided and we are happy with our approach. It's shocking to think we only have around 18 Christmases with our kids at home! Instead of having a holiday season that rushes past without having time for memory making nor lesson teaching, why not get ahead of the season by doing a few key things now. My oldest is almost 4. We have never pushed the Santa thing. He will come but we don’t hold Santa over his head and have decided to focus on the real meaning of Christmas to instead of a Christmas of want! Did the kids still enjoy it? I’ve been looking for a good kids book to help explain the history of Santa. We are actually approaching it the same way you are! I think the book is probably above a 2 year olds understanding but it is great! We have an advent wreath with candles that we light every night after dinner and read a short devotion. Yes we got candles this year too and I can’t wait to do that! Oh my husband so wants us to get into that! Rachel – I love this! This is kind of the thought process Zach and I went through and what we decided we would do with Parker. Jessica and Adam kind of did the same thing. Thanks for sharing! Thanks, Letha :) Yeah it just seemed like the best of both worlds, really! Let me know if Parker “gets it” this year. I feel sure mine won’t yet. Ha! Good thoughts on this! We just this conversation with some friends the other day! Everyone views it so differently, but I really like your perspective on it and totally agree. That is almost exactly what we do, except we haven’t really thought it out like you did! :) Would love to win the book!